Day 1. A banner day for sure. Richard Stover and I hiked from the Cottonwood trailhead to the west side of New Army Pass a distance of 8.2 miles with 2600' of elevation gain. A serious workout for us, especially with the weight of bear cans holding 9 days of food. Since we had arrived at the trailhead after dark and since it was raining, we opted to recline the seats in our Honda Civic to sleep instead of finding a campsite and setting up a tent. After a fretful night, we enjoyed good omens as both a toad and a Pacific Chorus Frog hopped across the trail shortly after we started hiking. 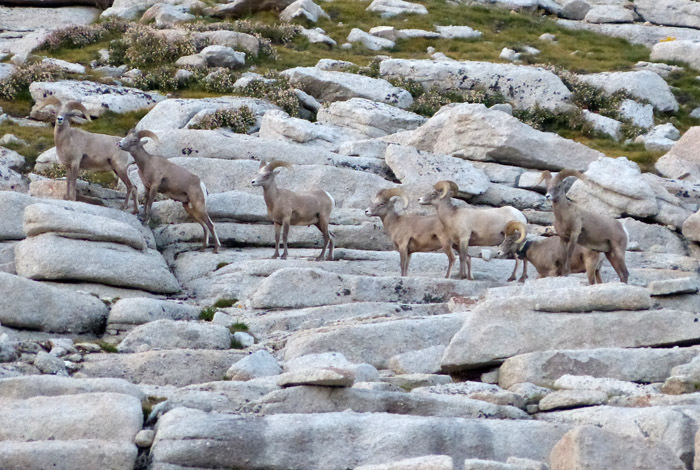 The day ended with a crescendo as 7 Bighorn rams, one with a radio collar, passed close to our campsite. In between the frogs and the sheep we saw a variety of birds including white breasted nuthatches, mountain chickadees, brown creepers and more. Day 2. We left camp at 8:30 a.m. and headed west along Rock Creek. After reporting our sheep sighting at the Rock Creek Ranger Station (Ranger was not there), we forded Rock Creek and hiked north off trail toward the headwaters of Perrin Creek. When we started up Perrin Creek, it was a marshy meadow at least 100 yards wide sheeting into Rock Creek. Water flowed along the surface and underground. As we proceeded upstream, the flow merged into a single channel which at times roared over cliffs. We were glad this had been a wet year since I didn't know if the lake at the head of Perrin creek had water year round. 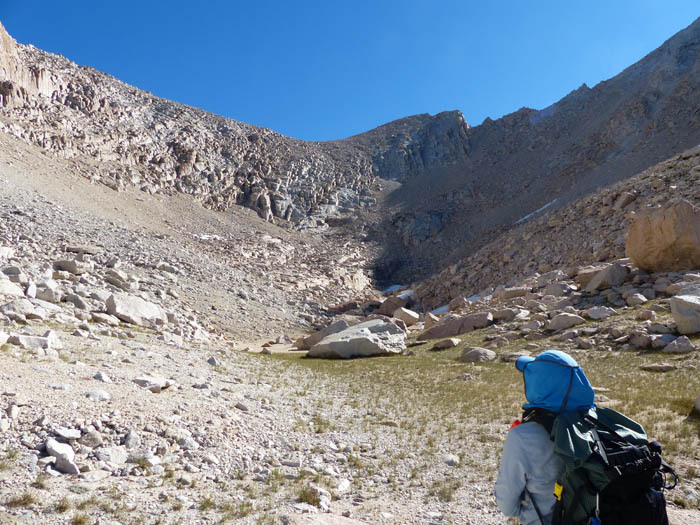 Our objective was Mount Newcomb, a 13,000-foot peak rising above the source of Perrin Creek. 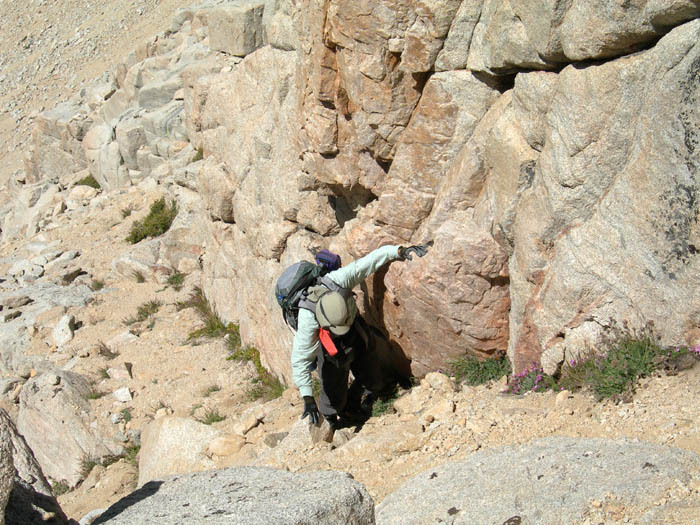 We climbed over 1000' keeping to the west of the creek to avoid difficult boulder fields and lateral moraines. The off-trail ascent with full packs was not easy. To our surprise above 10,000' Perrin Creek was dry! "It's running underground," I concluded. It had been so strong only a few feet below. "Surely it will emerge when we get to less steep terrain." There were campsites aplenty. Flat ground but no water. Our water bottles were getting low. We hadn't bothered to fill up back at Rock Creek since we were following Perrin Creek. It was getting late. We were getting tired. We stopped for the night. "Surely we are feet away from water," we reasoned. We downed the last swallows of our water. 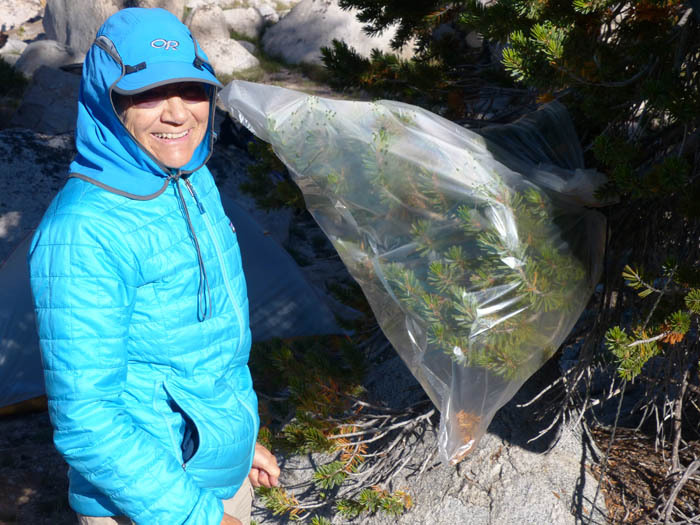 As Richard set up the tent, I tied two plastic bags around branches of the lovely Foxtail Pines by our camp. Trees exhale water and it's possible to capture it with clear plastic bags. I had practiced this technique in the desert. I set up a plastic bag to catch some water. No supper without water. Only three hard candies each. We'll solve this problem tomorrow. Day 3. Up early, we walked upstream without our packs carrying only empty water bottles to find cool, flowing water 20 minutes above camp. Perrin Creek was on the surface again. Heavenly water. Water for tea, water to splash in, to wash with, to play in and drink. Pure, clean, clear water. We drank our fill then carried 3 liters back to camp where we cooked last night's supper for breakfast. (The plastic bag trick needs heat so hadn't produced any water over night.) Then we moved camp to a lovely valley at 11,170' dotted with Foxtail Pines and surrounded by peaks. The flowers greeted us: Baby Elephant Head, sneezeweed, whorled penstemon, tiny yellow monkeyflowers, and more. Day 4. Today we climbed Mount Newcomb, named after Simon Newcomb a world-renowned astronomer who died in 1909. In 1888, Newcomb wrote, "We are probably nearing the limit of all we can know about astronomy." Richard, who is an astronomer, got a kick out of that quote. By 1903 Newcomb had changed his mind. Old geezers that we are, we left camp at daylight and returned 12 and a half hours later. 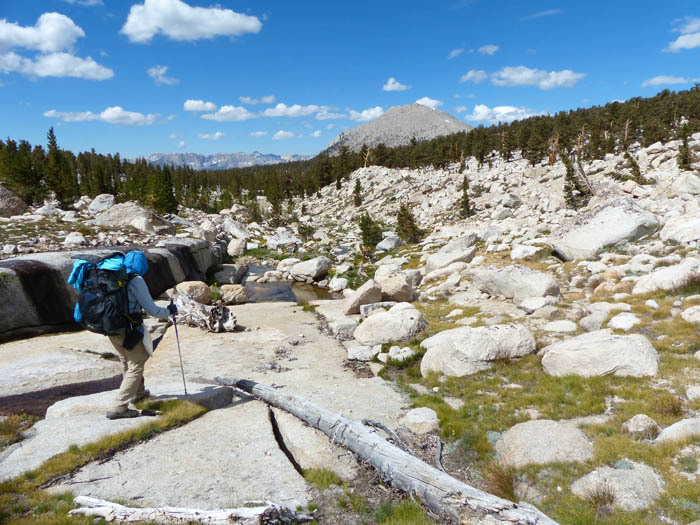 When we reached the headwater lake and finally had a glimpse of our route, we stared in wonder. This so called "easy climb" looked impossible. It was a giant headwall. Could we climb it? "If I were alone, I would turn around now," Richard thought. The summit is not quite visible. It is in the center of the photo to the left and behind the two bumps. Of course everything looks harder from a distance. Close up I knew we would find a route, and we did. And finally the view! Amazingly we found a lost balloon in this remote place. Another tribute to human carelessness with this beautiful planet. 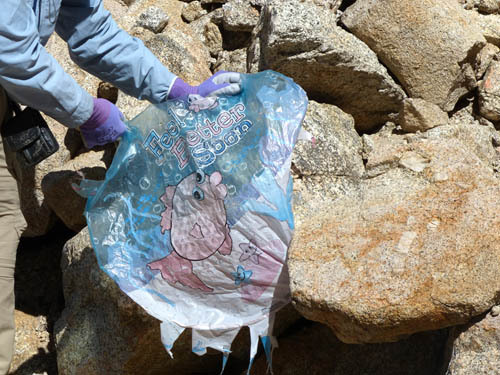 We found this balloon partway up Mt. Newcomb. Richard climbing up a steep section. The view from the summit was superb. 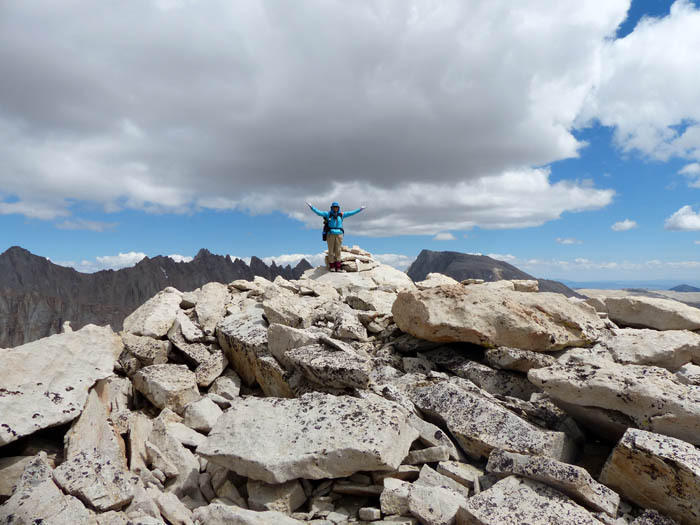 We could see Mount Whitney to the north and with the camera's telephoto lens, even people on Whitney's summit. To the south was Mt. Pickering (which we had climbed in 2004) and on the other side of Rock Creek, Mt. Anna Mills, one of the few Sierra peaks named after a woman. We had a great view of Mt. Chamberlain (also climbed by us in 2004) to the southwest. Finally the summit. Mount Langley is on the right behind me. The return to camp was careful and uneventful. A glorious day. Day 5. The next day we slept late (7:30 a.m.) and leisurely descended to Rock Creek making sure we had full water bottles to get through the dry section. Hiking back down Perrin Valley. Mount Anna Mills can be seen looming up in the center of the photo across Rock Creek. After fording Rock Creek, we hiked directly south crosscountry up a ridge in order to reach Forgotten Canyon. As we climbed the hillside we couldn't help noticing that the boulders south of Rock Creek were different than the glacial leavings in the Perrin Creek drainage. These boulders were much older, much rounder and more eroded. Few people visit this out-of-the-way area. We were hoping to set up a base camp and climb Mount Anna Mills. From the map I could see that two creeks flowed nearby: Siberian Pass Creek and what we called Forgotten Creek which flowed north through the canyon from a tarn at its source. Both were DRY. I didn't have much hope that there would be water in the tarn, so we did the prudent thing and turned around. We'll be back, likely earlier in the season and probably from a different route. Our descent to the trail through boulder fields, wetlands and willow thickets sent up clouds of spores from a yellow fungus on the underside of the willow leaves which set me off in sneezing fits. We followed deer paths and bear routes. Days 6 and 7. The next two days were spent climbing back over New Army Pass and returning to the trailhead. Our thoughts were turning toward the pleasures of a hearty breakfast in Lone Pine.